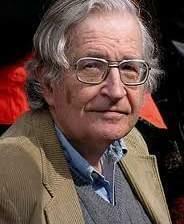 Noam Chomsky is a US political theorist and activist, and institute professor of linguistics at the Massachusetts Institute of Technology (MIT). Besides his work in linguistics, Chomsky is internationally recognized as one of the most critically engaged public intellectuals alive today. Chomsky continues to be an unapologetic critic of both American foreign policy and its ambitions for geopolitical hegemony and the neoliberal turn of global capitalism, which he identifies in terms of class warfare waged from above against the needs and interests of the great majority. Chomsky is also an incisive critic of the ideological role of the mainstream corporate mass media, which, he maintains, "manufactures consent" toward the desirability of capitalism and the political powers supportive of it. On the role of the mass media, Chomsky argues that the vested corporate interests controlling newspapers, television, and radio, no less than the content of what these outlets offer, form what he and Edward Hermann in their seminal study Manufacturing Consent call a "propaganda model" supine in the service of power. Chomsky's bibliography consists of over one hundred titles, spanning over sixty year's worth of work and research, vastly contributing to the public dialogue of both linguistics and politics. His most recent publication is a second edition of a collection of essays and interviews entitled, 9-11: Was There an Alternative? Ralph Nader's latest book is "Only the Super-Rich can Save Us." Ralph Nader is one of America's most effective social critics. Named by The Atlantic as one of the 100 most influential figures in American history, and by Time and Life magazines as one of the hundred most influential Americans of the twentieth century, his documented criticism of government and industry has had widespread effect on public awareness and bureaucratic power. Morris Berman is well known as an innovative cultural historian and social critic. He has taught at a number of universities in Europe and North America, and has held visiting endowed chairs at Incarnate Word College (San Antonio), the University of New Mexico, and Weber State University. During 1982-88 he was the Lansdowne Professor in the History of Science at the University of Victoria, British Columbia. Berman won the Governor's Writers Award for Washington State in 1990, and was the first recipient of the annual Rollo May Center Grant for Humanistic Studies in 1992. He is the author of a trilogy on the evolution of human consciousness-The Reenchantment of the World (1981), Coming to Our Senses (1989), and Wandering God: A Study in Nomadic Spirituality (2000)-and in 2000 his Twilight of American Culture was named a "Notable Book" by the New York Times Book Review. During 2003-6 he was Visiting Professor in Sociology at the Catholic University of America in Washington, D.C. Dr. Berman relocated to Mexico in 2006, and during 2008-9 was a Visiting Professor at the Tecnologico de Monterrey, Mexico City.